When I lived in New York and would tell people that I was from Peoria, many times I got a response like this: “So what’s Peoria like, Mayberry?” I would always defend Peoria and tell people that it’s a great city with a lot of interesting people in it and fun things to do. But driving around the other day, I saw something that Peoria may have in common with Mayberry, after all. It seems that Peoria has its very own, Floyd the barber. Here's the barber shop I spotted the other day while driving down Adams Street in downtown Peoria, Skippy's & Floyd's. It looks like a cool place. The sign says, "Open," so let's go inside. Wow, it's like a trip back in time in here! You don't see old school barber shops like this very often these days. And here's the man himself, Peoria's own Floyd the barber: Floyd Jackson. Floyd told me his older brother Omega "Skippy" Jackson started the shop in another location in 1963. That shop burned down in 1971 and he relocated to this location at that time. Floyd had worked at Pabst Brewery, but came here to work with his brother when Pabst shut down in 1982. 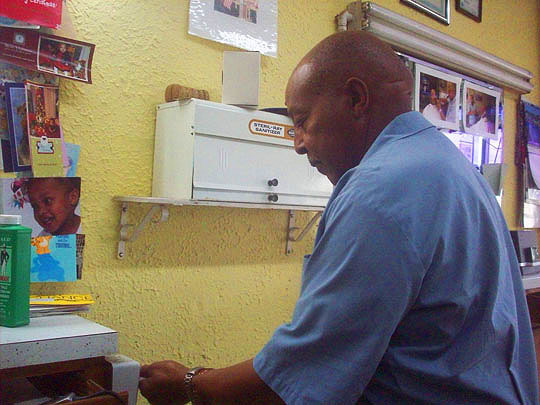 Skippy has since passed away and Floyd is now the sole owner of Skippy's and Floyd's barber shop on Adams Street. Floyd graciously told me to go ahead and take a self-guided tour before my haircut, so let's take a look around in this classic barber shop in downtown Peoria. There's two overhead fans that spin underneath a white tin ceiling. Some tools of the barbering trade sit on a shelf near the mirror at the first barber station in the shop. Tools of the trade, phase two. In which Doris gets her oats. Floyd told me this is the original cash register from when Skippy first opened in 1963. I think even MBIP friend and commenter Katrink will agree that this qualifies as a vintage cash register! A shot of the shop from the back of the room. Gray metal folding chairs line the walls and are often filled with people from the neighborhood coming in for a visit and to chat with Floyd, the friendly barber of Adams Street. The music in the shop is handpicked by Floyd, most of it is blues and jazz played at a conversational level. This is the price list on the wall. I think next time I come here I'll get a shave, I've never had that done in a barber shop and besides, I need to stay loyal to my regular barber, Dori. Here's a magazine article that featured the barber shop. Goldie stopped in to visit with Floyd and read the paper. He told me he's been stopping in and getting his haircut here for over a hundred years. The tales are tall here in Skippy and Floyd's! Floyd pointed out this photo of his brother Skippy on one of the mirrors. As you can see, they, just say no, here in Skippy and Floyd's. It's definitely not politically correct in here and it's one of the many things I love about this place. Floyd told me this cosmetics ad has been hanging on the wall since the day the shop opened up. Okay, enough of looking around in here, time for my haircut, there 's two chairs, one barber and no waiting. I love the ornate, silver foot rest on the barber chair. You won't find this at a Supercuts! Like a surgeon, Floyd methodically prepares to get to business. Here we go with the mane event already in progress. This is the view from my perch atop the barber chair. And here's the finished results. Great work by Floyd the barber and thanks to him for the hospitality. I'll be back for that shave soon! See you all tomorrow! Further Reading: Barber Shop Photo Story, Art of Manliness and Men’s Health. Steamed hot towel on my face.